The Author of the book “The Lord Our Righteousness”, Obadiah Grew was born on November 1, 1607 the third son of Francis Grew and Elisabeth Denison. Obadiah was educated in the town of Reading under his uncle John Denison, and was later admitted into Balliol College, Oxford, in 1624. He graduated with a Bachelor’s degree on February 12, 1629 he continued on to get his master’s degree on July 5, 1632. Obadiah was ordained in 1635 by Robert Wright, bishop of Coventry and Lichfield. During the outbreak of the First English Civil War he sided with the parliamentary party. In 1646 Grew took part with John Bryan in a public dispute about the matter of infant baptism at Trinity Church, with HanserdKnollys. In 1662 Grew was unable to comply with the Act of Uniformity because of this he resigned his living as a preacher. However his bishop John Hacket was anxious to retain him, and allowed him to preach a mouth beyond his appointed day to conform to the act.In late September he preached his farewell sermon. Grew continued to preach freely in Coventry, during1665when the plaque hit it so devastated the land that there was scarcely a preacher left. In 1682 Grew nearly lost his eyesight, was convicted under the Five Mile Act and was imprisoned for six months in a Coventry prison. During this imprisonment Grew dictated several sermons to an assistant. In 1687 after James II declared the Declaration of Indulgence Grew returned to his congregation in West Orchard. Grew preached there until 1689 when his health steadily declined. Obadiah Grew died on October 22, 1689 and was buried in the chancel of St. Michael’s. Many of Obadiah Grew’s sermons went into print among these include “The Lord Our Righteousness”“Meditations Upon Our Saviors Parable of the Prodigal Son” (1668) and “His Farewell Sermon on Acts 20:32” (1668). 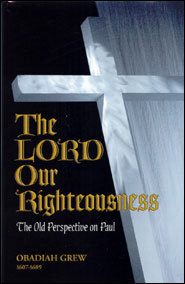 In the book the “Lord Our Righteousness”author Obadiah Grew defends the doctrine of Christ imputed righteousness. That is to say the sinner’s righteousness is Christ righteousness made his, therefore Christ is the “Lord our righteousness”. Grew starts with the verse from which the book is titled. Jeremiah 23:6 “In his days Judah will dwell securely; and this is His name by which He will be called the Lord our righteousness” (pg.1). Obadiah Grew makes a concise and thorough effort throughout this book to show just how this doctrine is to be understood and applied. At the start of this book Obadiah Grew explains what he means when he declares that Jesus Christ is “the Lord Our Righteousness” (pg.2). He then defends his argument scripturally, by asking and then answering various objections to his opening statement. Throughout the book he follows this motif first by declaring the doctrine, defending the doctrine by scriptural backing and then showing how the doctrine can be understood and applied to the life of the believer. In the preceding chapters Grew continues in his defense of the necessity of Christ righteousness being imputed to the believer. He shows throughout the book the importance of a proper understanding of this essential scriptural truth, which he calls “the vein of the gospel” (pg.28). He argues that to stray from such a truth leaves one in danger of seeking one’s own righteousness (pg.26). Throughout his book Grew lays out his argument, namely that the sinners only hope in being declared righteous before a holy and just God is to be declared righteous through Christ’s righteousness made his own. Grew concludes with as he sees it a key aspect of the doctrine, that is its application to the life of the believer. Grew explains how a proper understanding of this doctrine should give great comfort to the believer. In the eyes of Grew this should lead the sinner into a life of grateful obedience for God’s gracious gift, the gift of Christ (pg.101). In the preceding pages I will evaluate Obadiah Grew’s book in greater detail starting with chapter one through to the books conclusion. In chapter 1 Grew begins by overviewing various names given for God in the scriptures, such as Jehovah Jireh“the Lord will see or provide” and others. He then comes to the name for God Jehovah Tsidkenu“the Lord our Righteousness” from which the book is titled. He then states the doctrine, namely how Christ is the Lord our Righteousness, or in other words the righteousness of a sinner is Christ righteousness made to him (pg.3). Following his open statement Grew goes through a series of questions and answers. Questions such as “how did Christ voluntarily take upon himself by his own consent and suffered what we as sinners deserve” (pg.7). Grew answers this question by stating the two ways in which Christ suffered punishment one being punishment of sense, Grew uses scripture to back his point “My soul is exceedingly sorrowful even unto death” (Matthew 26:38). The other being the punishment of loss, he uses Psalm 22 to make this point “My God My God why hast thou forsaken me” (pg.7). In chapter 2 Grew states “two things must be opened and demonstrated: that Christ is our righteousness, and how the righteousness of Christ is made ours so that we may comfortably so call it and use it”. (pg. 10) Grew writes the following “the Lord Jesus Christ is the righteousness of a sinner, and that for which God reputes and accounts a sinner a righteous man” (pg.10). He gives various passages of scripture to show just how this is so. Passages such as (Acts 13:39). “And by Him everyone who believes is justified from all things from which you could not be justified by the Law of Moses”. Grew gives further scriptural backing for this point by quoting (2 Corinthians 5:21) “He made him who knew no sin, sin on our behalf that we may be made the righteousness of God in Him” (pg.11). In chapter 3 Grew intends to show the various guides that lead the sinner to justifying righteousness. Grew begins developing his point by showing how Israel sought their own righteousness, not the righteousness of God (pg.26). “Why did Israel fail, because they sought this righteousness apart from faith that is in Christ, but by works of the law” (pg.26). Grew explains how a sinner is lead to this righteousness by stating “So doubtless it is the Spirit of Christ that must help a sinner to find out his justifying righteousness and show him where it is”(pg.26). In Chapter 4 Grew explains the “great motive in justification” he explains by stating “The great motive to this way of justifying a sinner, and making him righteous by the righteous of the Lord Jesus Christ is the free grace and favor of God; it is an act of grace” (pg.32). Grew quotes Isaiah 63:9 to demonstrate his point “In His love, and His pity he redeemed them” (pg.32). In Chapter 5 Grew gives four uses of the doctrine of Christ imputed righteousness. The first use, how the Christian must first be knowledgeable in this doctrine. He states the following on this point “You will never sit fast, nor be in a settled state, until then”. On the second use of the doctrine Grew tells the believer “to be well versed in Christ’s righteousness as founded in free grace, and it will be a good nurse to obedience and a godly life”(pg.41). Use three is on the free gift of this righteousness this free gift as Grew sees it should lead the sinner to Christ. Grew writes on this as follows “There is no price or money to be paid for it; it is of free grace it is a free gift (Romans 5)” (pg.42). On the fourth use of this doctrine Grew writes “This doctrine of Christ’s righteousness laid on free grace is a doctrine that galls proud Christians and men of parts to the heart; such as trade for their own reputation with their parts and duties” (pg.42). In Chapter 6 Grew focuses on God’s part in making Christ’s righteousness ours, Grew writes on this the following “The righteousness of Christ is made ours, on God’s part by imputation, God counts it unto us for righteousness, and it is so, as the Scripture says, Abraham believed God, and it was accounted to him for righteousness” (pg.46). Grew sums up his argument by writing “thus the righteousness of Christ that justifies us before God is not a righteousness of His in us, but a righteousness put upon us” (pg.47). In chapter 7 Grew explains his view on the role the sinner plays in making Christ righteousness his own. The summation of his argument in this chapter I believe can be summed up by the following, Grew states “Faith is the great and only instrument in man that God is pleased to use in transplanting Christ’s righteousness to him” (pg.60). So a man must have faith to come to Christ, but this faith is also a gift of God (Ephesians 2:8). In the final chapter of his book Grew focuses on the application of this doctrine to the life of the believer. He concludes by exhorting the believer to have everlasting thankfulness to God and Christ for the riches of this free grace, and to live in grateful obedience because of his grace given to him (pg.101). In conclusion, I would recommend this book for anyone who desires to come into a better understanding of this important doctrine. Obadiah Grew in my view indeed gets the point across that through Christ alone is a sinner made right with God.